Some 800 more people a year could be killed or seriously injured on the UK's roads if all speed cameras were scrapped, a report has suggested. Professor Richard Allsop said cameras had offered continuing road safety benefits since they were introduced. 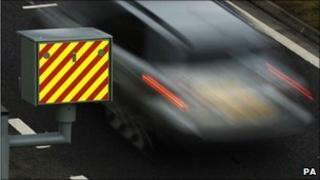 Several councils have decided to scrap their speed camera programmes after the government cut road safety grants. The RAC Foundation, which commissioned the report, said the study suggested such moves would be a "big mistake". The report by Prof Allsop, who is emeritus professor of transport studies at University College London, also found that speed cameras were not a significant revenue raiser. He said that in 2007 the Treasury received just £4 from each £60 penalty, and there was no surplus left for local authorities or the police. Professor Stephen Glaister, director of the RAC Foundation, said: "The current crisis in funding for speed cameras, and road safety in general, leaves road users at real risk. "The government has said decisions on speed camera funding must be taken at local level which is why we are sending this evidence direct to all highway authorities." He added: "Professor Allsop's work suggests scrapping cameras would be a big mistake because the cash to install them has already been spent. "They save lives and demonstrate value for money, and despite the headlines most people accept the need for them." Road Safety minister Mike Penning said it was right that local councils decided how best to tackle specific road safety problems in their area. He said: "We ended central government funding for new fixed speed cameras because we don't believe we should dictate to councils that they use them as the default solution in reducing accidents. "It is not true however that the government has cut all funding for road safety, rather we have removed ring-fencing from local authority grants so that councils are able to set their own priorities. In September another motoring organisation, the AA, warned that lives would be put at risk if councils scrapped speed cameras. Cameras were axed in Oxfordshire in August after the county council withdrew £600,000 in funding due to budget cuts. About 6,000 speed cameras have appeared on Britain's roads since they were introduced in 1992, generating some £100m in fines each year. Do speed cameras really cut accidents?